● Innovative QF air distribution system Eliminating cold air intake for warmer, richer flavors, increasing and optimizing the airflow to create even bigger and denser clouds than ever before! ● No more spit back The bullet-shaped inner structure change the air flow to prevent liquid from coming up through the drip tip. ● Best leak protection By having the QF airflow and an internal reservoir design, we have minimized the leaking and maximized the use of your e-juice by recycling any that potentially lost. ● Flax Fiber with Cotton Longer coil lifespan & more consistent flavor ! The bottom airflow system can be adjusted by twisting the airflow ring. 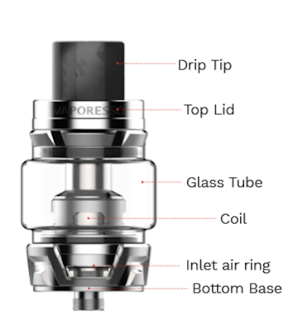 Unscrew drip tip to unlock the tank, rotate lid on the direction indicator and then you can fill your favorite E-juice in. Remove base to unscrew the coil and insert the new one. Secure the base back onto the device. There are a variety of coils available for SKRR Tank. Please select the coil you desire.